With Green Initiatives becoming the norms these days, lots of people are looking for elaborate ways to save electricity and reign in their energy-sucking computers. Looking at the numbers, we can see that just turning off something like a CRT monitor when it’s not in use can save a lot of juice. There are quite a number of elaborate schemes and utilities (both hardware and software) to try to reduce the draw of these necessary components. Windows provides Power Schemes to allow you to control the behavior of computer components when they are not in use and this article will cover a lot of the related tools that can hook into the Window provided components, but make it easier to control from a centralized location with group policies, scripting, or just a change of interface. In the Control Panel, you’ll find an entry called Power Options. Here you can change various settings like when to turn off the monitor and/or spin-down the hard drive after so many minutes of being idle. You can see a number of pre-configured power schemes already there for maximum performance or maximum battery life. You can create your own scheme and customize it so that it aligns with your practices. Manually changing the power scheme would only allow you to change those machines you can get your hands on. The amount of money saved by reducing power consumption would be multiplied by how many machines you can set to more energy efficient behaviors. In that case, we want to be able to control the power scheme from a centralized location like a logon script or a group policy. Windows doesn’t currently have power management built-in to the Group Policy Object Editor, but we can add the functionality by adding a custom template. The EPA actually provides a tool that allows this to be set remotely. It actually comes as part of a whole package. There is a (.msi) tool that will need to be deployed to your machines and then that little agent can read the settings being sent down via GPO and apply them. You can find the entire package, EZ GPO, available from the Energy Star website. It also comes with a tool to test that the correct settings are being applied and it can double as an off-line utility in that you can change the settings with this easy tool. Another utility from the Energy Star website comes in the form of EZ Wizard. Basically, EZ Wizard is a stand-alone executable that you can run that will launch into an application to configure your PC into any of three pre-configured settings. Aggressive, Intermediate, and Modest. The different settings are explained, but with a simple click you can change your power settings to different levels of power consumption. This would be a good tool for stand-alone users that want an easy interface to set and improve their power savings. POWERCFG /change EnergySave /monitor-time0ut-ac 10 – Set the rule for the EnergySave scheme to turn off the monitor after 10 minutes of being idle. POWERCFG /setactive EnergySave – Set the EnergySave scheme to be the active, enforced power management scheme. POWERCFG /query EnergySave – Display the current settings of the power management scheme called EnergySave. You could put this in a login script or whatever you like to create a new scheme and set it to the one enforced with the rules you want. If the scheme with that name already exists, it will just report that fact and move onto the next command. If you’re looking for more control and even greater savings, you’re going to want to start looking at your infrastructure. There are a variety of things that can be used to allow users to turn off their computers at the end of the work day and then have them boot up in time for patching and be ready to go the next morning. 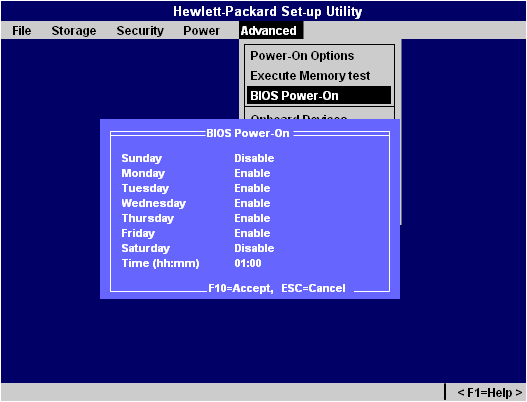 BIOS Power-on options – One simple thing to look into and start off with would be the BIOS Power-On option. You can set this configuration to power on the computer at a specific time for certain days of the week. See the screenshot below. Monday through Friday, the computer will power on at 1 am. You could set this to any time to allow plenty of time for patching to complete but also leverage no power being drawn from 5pm – 1am if the employee turns off the computer when they leave at 5. Wake-on-LAN – WoL has always been the pipe dream of system administrators. A machine is able to be turned on, on-demand just by sending it a message across the network. Unfortunately, it’s turned out to be relatively unreliable and encounter errors on complicated networks where the wake-up packets (the MAC address of the machine repeated 4 times) have to cross routers, VLANs, and subnets. Intel AMT / vPro – Intel’s vPro, the marketing name for AMT, has answered the call in an attempt to provide a more reliable Wake-on-demand. vPro is better integrated with other management tools like the Altiris tools. You would be able to send this system a series of commands like: Wake up, patch, Shutdown gracefully to a batch of computers. I haven’t been able to get this part to work as promised, so I’ve saved that for another post. You can provision your computers easily in a Small Business Mode. This allows you to visit machines individually through a web interface. You can then remotely power them on or off, get inventory information, or filter malicious network traffic. Green Snapper – Green Snapper is an interesting system from a company based in Finland along the lines of WoL that promises to save you a lot of green by cutting your energy costs. The company is definitely in the preliminary stages of rolling out their product, but their website talks a big game and it will be something to keep your eyes on. I contacted them but haven’t heard back yet in an attempt to learn more about their offerings. I guess it will be a waiting game to see when and what they might start offering state-side.